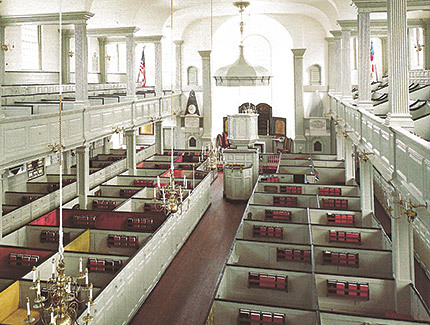 In colonial Rhode Island, separation of church and state fostered religious liberty. This freedom promoted a rich diversity of religious thought and worship. The quotes highlight ways in which the four houses of worship on our tour reflect Newport’s contributions to our nation’s liberty, philosophy, art, and architecture. 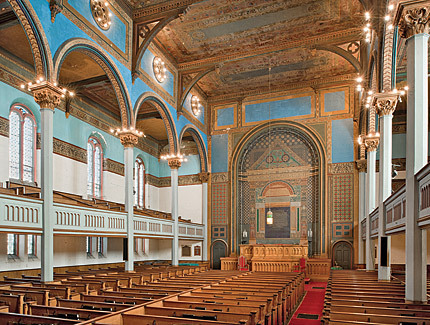 Hear the remarkable story of Touro Synagogue, a building of exquisite beauty and design, and America’s oldest Jewish house of worship. Designed by noted colonial architect Peter Harrison, Touro was designated a National Historic Site in 1946. Marvel at the exquisite geometric murals and opalescent stained-glass windows designed by preeminent 19th century artist John La Farge. Newport Congregational Church, once known as United Congregational Church, was designated a National Historical Landmark in 2012. Behold the classic colonial architecture of Rhode Island’s oldest Episcopal (Anglican) parish. 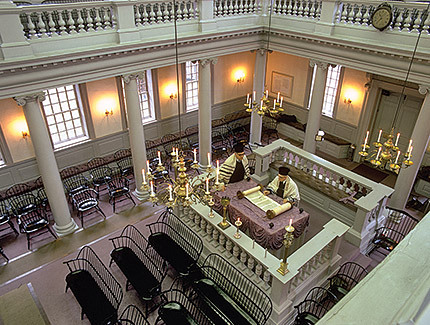 Sit in the same box pews occupied by General George Washington, the Vanderbilts, Archbishop Desmond Tutu, Senator Claiborne Pell, and Queen Elizabeth II. Dean George Berkeley, who later became the Bishop of Cloyne, preached many times at Trinity between 1729 and 1731. It was Berkeley who posed the famous question: “If a tree falls in the forest, but there is no one to hear, is there sound?” Local legend has it that he formulated his query while meditating in his favorite retreat – a niche in Hanging Rock, overlooking Second Beach. 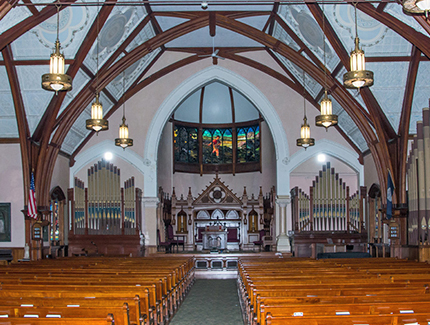 Experience a place where the congregation’s beliefs cover a wide range of modern religious thought. Enjoy stunning architectural features and learn why Channing was built as a memorial for William Ellery Channing, an early Unitarian minister and abolitionist.